I’m not alone in this. The people who go to doughnut shops at 3am look like drug addicts. They’ve got red eyes, pasty complexions, and only one side of their face works. They have only one thing on their mind as they push past the line, talking to themselves, warning everybody to look out, showing their cash to the guy behind the counter. “Yeah,” I said. Had he suddenly sprouted horns and a tail? “How about that basket?” I replied. This article was originally published in April of 1994 and is part of our Legacy series. Take a look back and laugh with some of the greatest voices in comedy history. 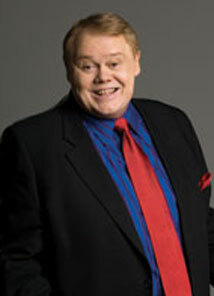 Louie Anderson is one of the most versatile and successful comedians working in Hollywood today, loved by the television audiences who never missed his nightly hit series Family Feud or his appearances on late night chat shows. He is adored by standing room only crowds in Las Vegas and respected by readers of his books. He is worshiped by the rising comics he mentors and encourages with his honesty and wisdom. Most mornings I buy a box of twelve doughnuts. Come on. It’s fifty cents for one or ninety-nine cents for a dozen. Eli Nicolas witnessed an interesting show on a recent trip to Thailand. Aaron Weaver had a day full of strange revelations. Sherwin Arae encounters all types at a massage parlor.